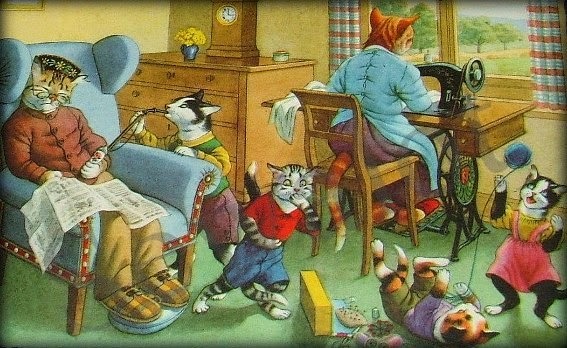 When felines and fiber invade your home. 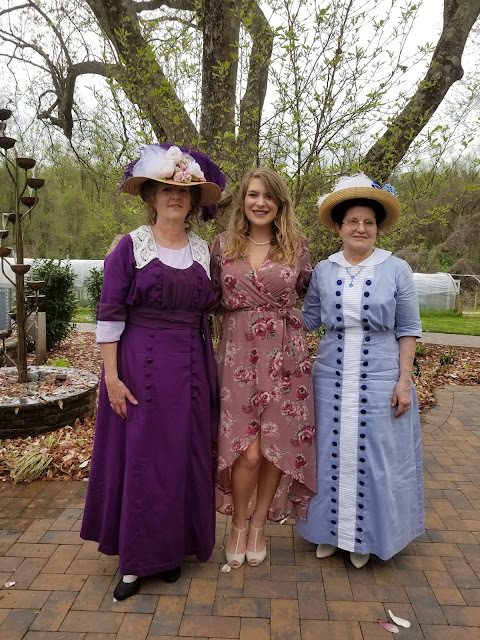 My friend Jan and I decided to attend a Titanic themed tea. 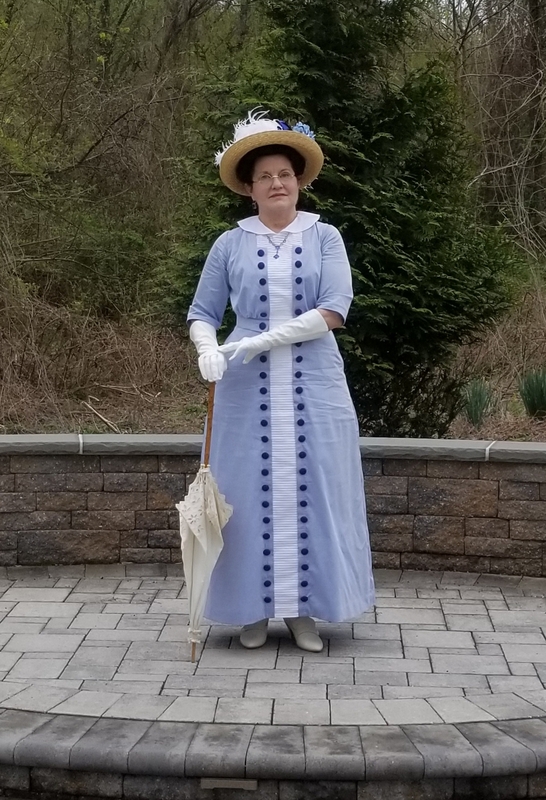 Jan is new to costuming and she got really involved in doing a lot of research, making all of the underpinnings as well as adapting a period pattern to match a fashion plate using period construction techniques. I think hers was the most impressive newbie outfit I've seen due to the time spent in research. I already had the most important pieces of Edwardian underwear and made the rest of what I needed. 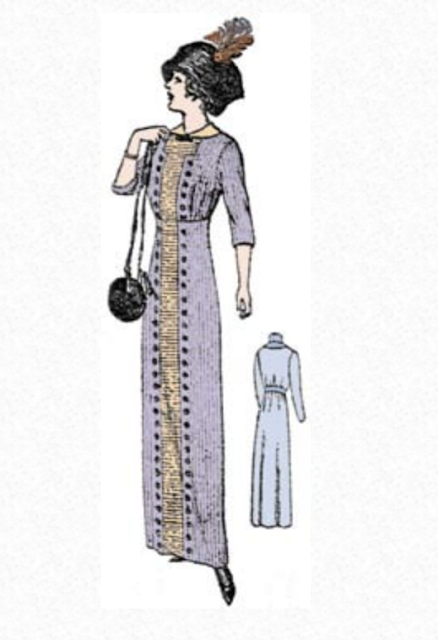 I'd been eyeing this one pattern from the Vintage Pattern Lending Library--1912 Dress with Four Gores, size 36. This is a reprint of an actual period pattern. These patterns do not have detailed instructions so it takes a while to figure out how to do certain things. I had purchased 1 yard of pleated Swiss cotton from Farmhouse Fabrics when they had it on special. 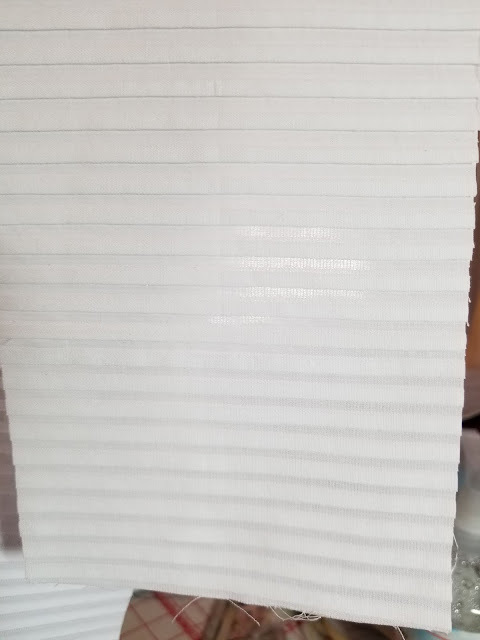 It's incredible fabric. 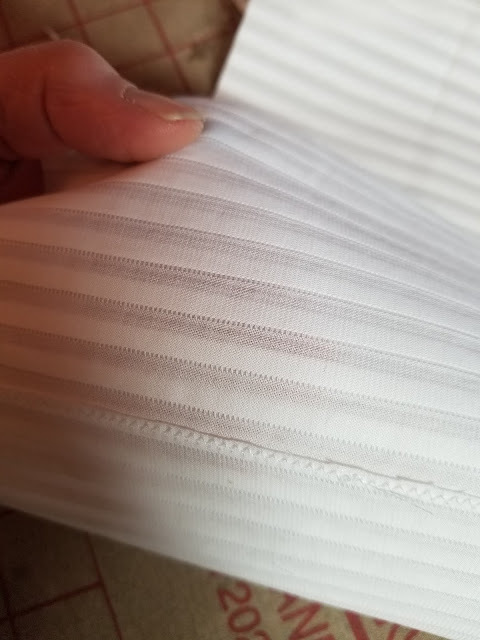 The pleats are woven in which shows at the selvedge. I planned on using that for the center inset but wasn't sure what to do for the rest of the gown. 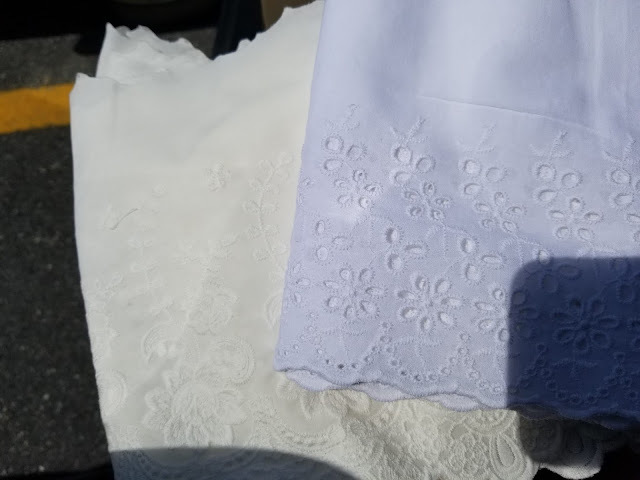 The pattern suggested silk, linen or pique. I originally wanted a yellow pique but just didn't find anything that turned me on. 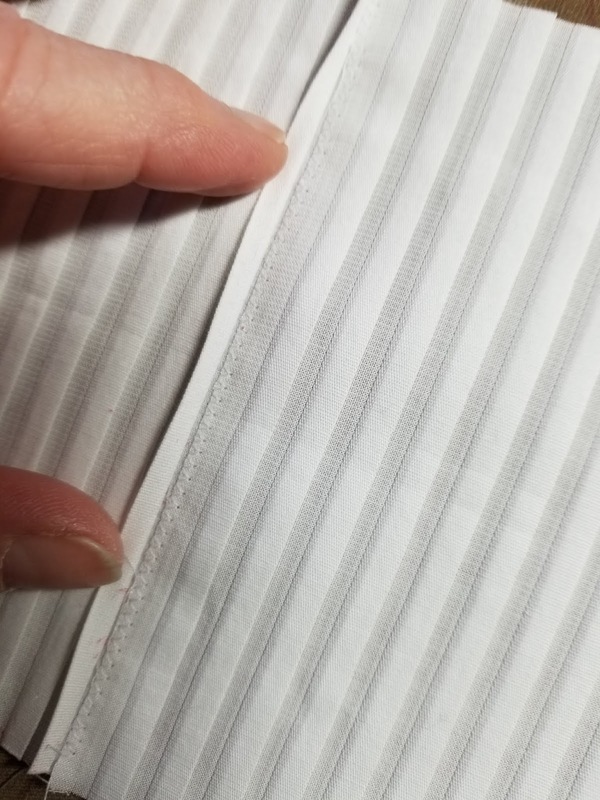 Then I came across this micro striped pique which I liked. 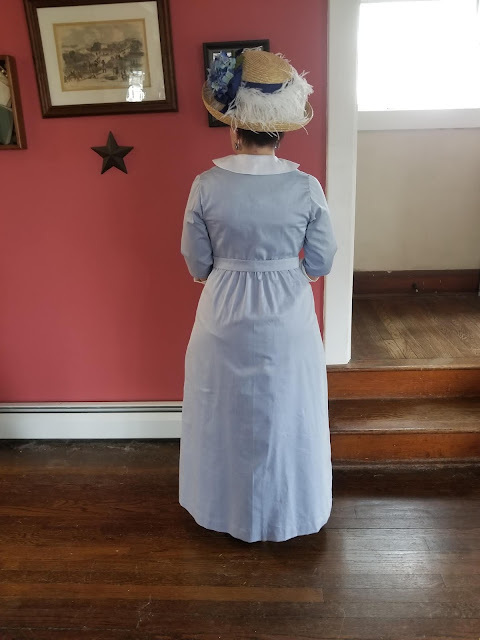 Even better was the fact that I had 3 yards of royal blue silk taffeta on hand for an 18th century petticoat. 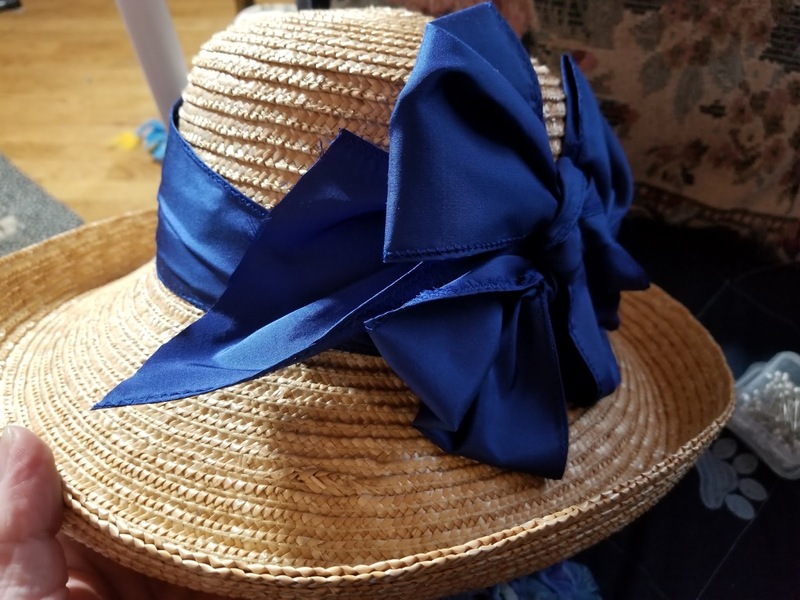 I only need 2 1/4 yards for that so I had enough to use for buttons and millinery trim. 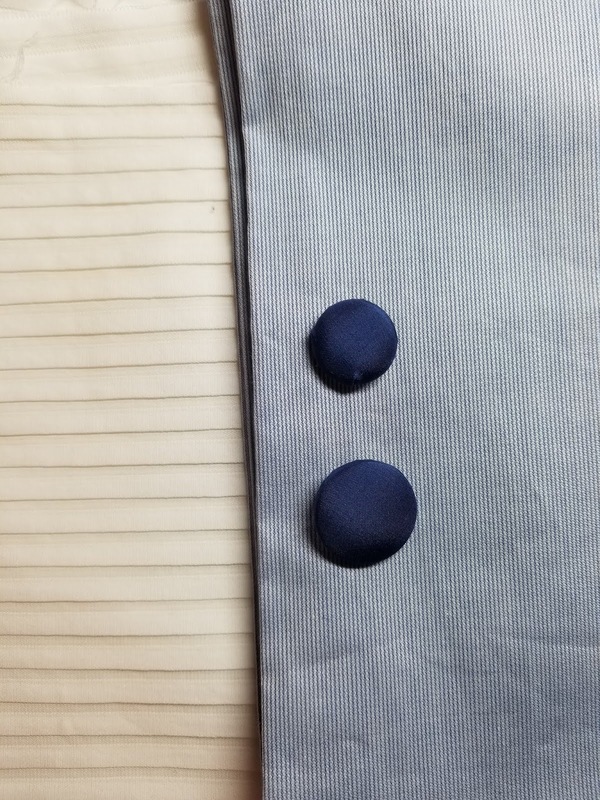 Next I experimented with a couple of sizes of self cover buttons to see what I liked. I decided on the 7/8 inch and ordered a bag of 100 of them on Amazon. I really didn't feel like making a fitting muslin of this gown. 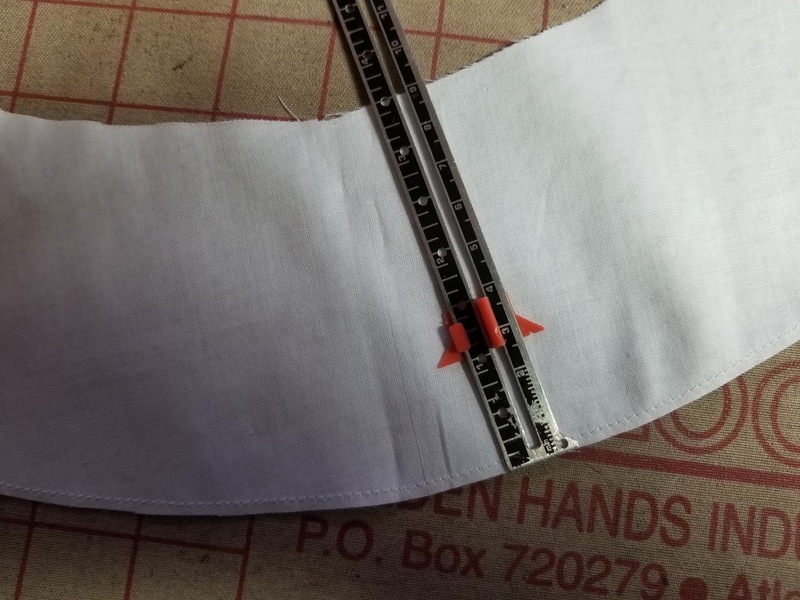 It's a pretty straight forward shape so I flat measured quite thoroughly, adding to the hips (as usual) and adding to the side seam allowances to give me a 1 inch seam allowance for fitting purposes. The original allowance is 3/8 inch. My next challenge was to piece the pleated fabric as the lower part of the gown. 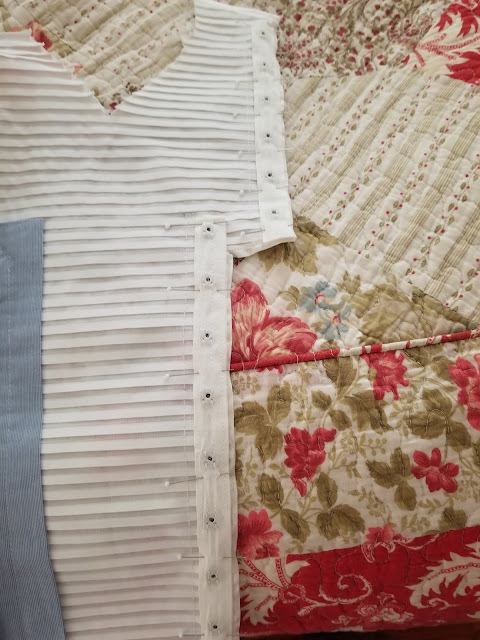 I used a narrow zig zag to stitch two pieces together under one of the pleats. I turned it to the wrong side and trimmed really close to the stitching. Voila! 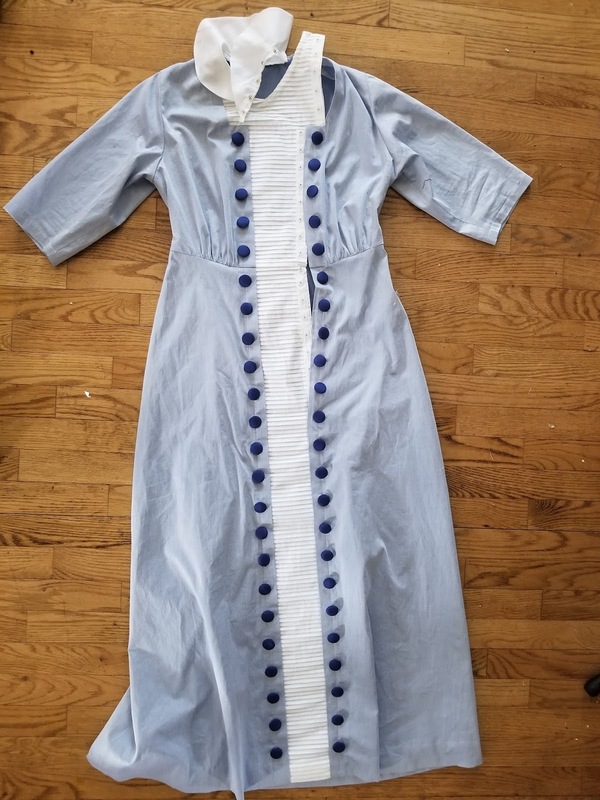 The pleats completely hide the piecing! 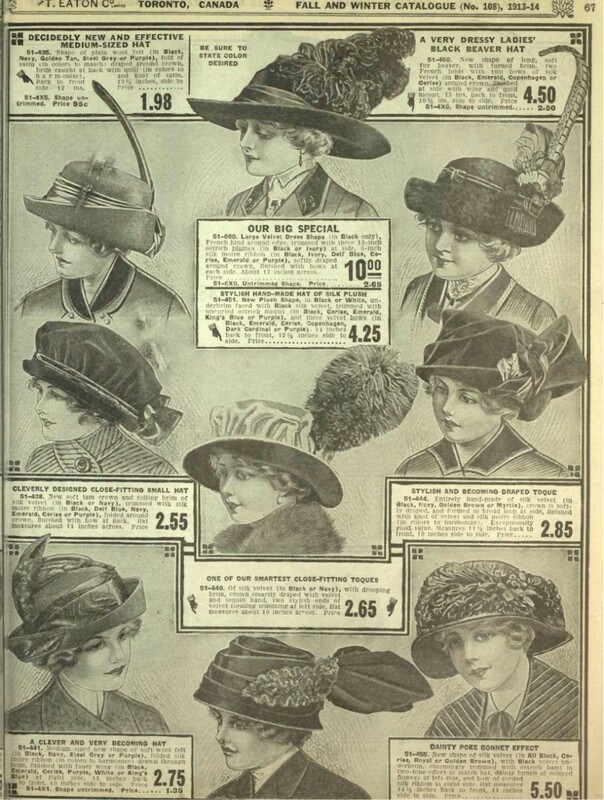 Early 20th century garments are constructed quite differently than the last quarter of the century. They tend to use hems instead of facings and they have unusual closures. First I had to hem the side pieces. 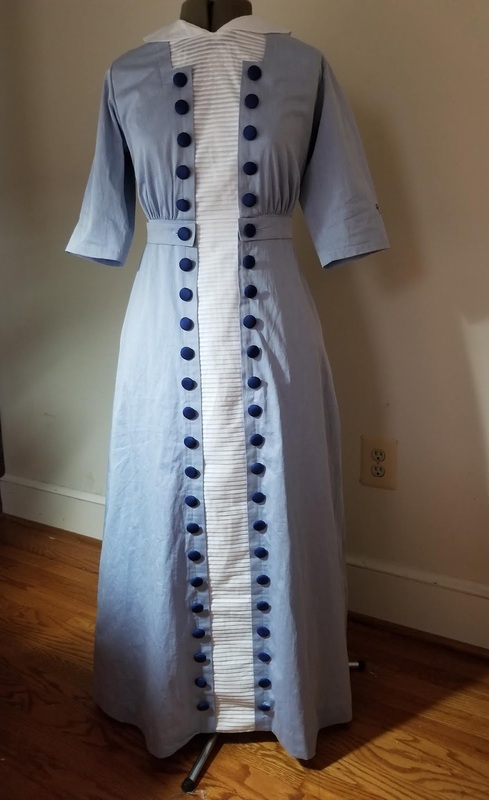 In a modern garment, this would've been done with a facing. 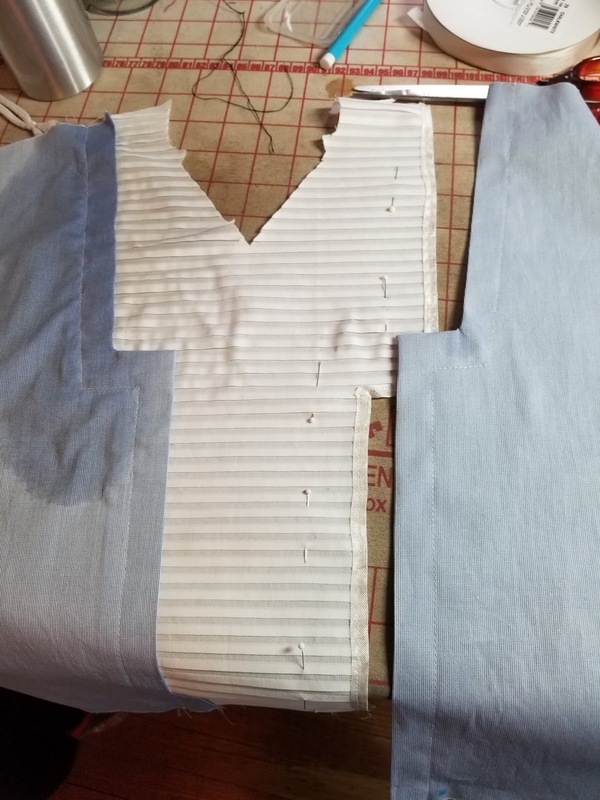 Then the inset gets stitched to the left side front on the bodice and also on the skirt. I laid it out together to play with the button spacing when the pieces were pinned together. 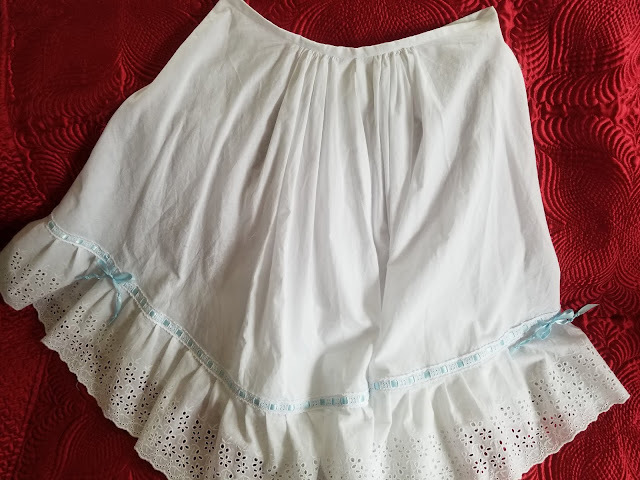 Then the inset was stitched to the bodice on the left side and to the skirt on the left side and halfway up the right side. 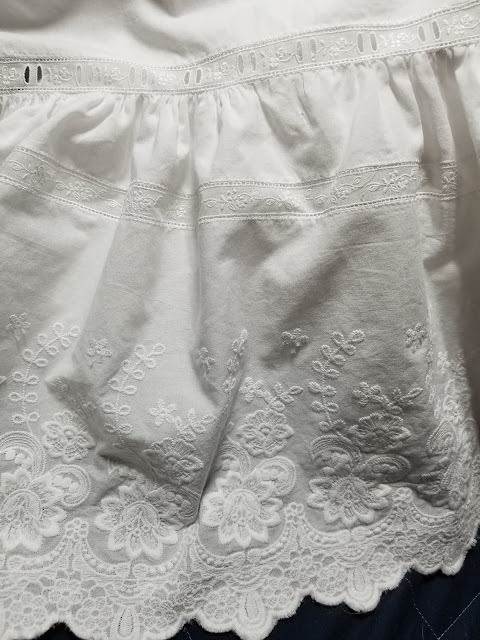 I pinned the waist seam and the side seams and tried it on over the underpinnings and was pretty happy with the fit. Then the fun began. 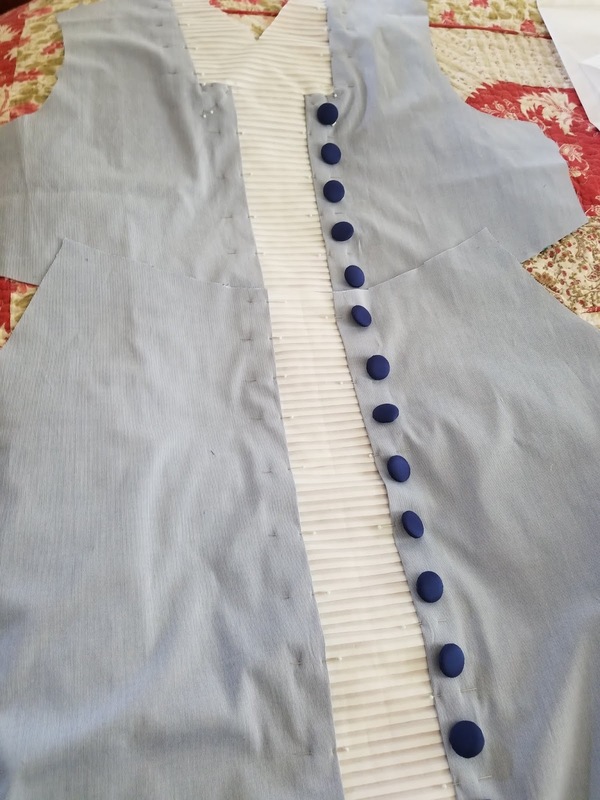 The pattern instructions said to stitch the shoulder seams and either use functional buttons or hooks and eyes on the right side. The problem with this is that stitching the shoulder would not leave any way to put the gown on as the neck is very small. 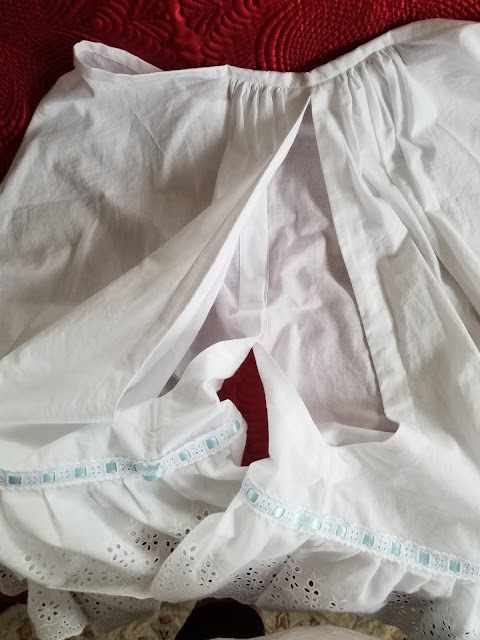 I did some research and found out from an antiques dealer that a lot of garments of this period have asymmetrical closures that open at the shoulder and have hidden snaps as closures. I had planned on using snap tape as I had found some that used old fashioned stitch on metal snaps. So I hand machine stitched one side of the tape to the white inset and hand stitched it to the blue fabric overlap. 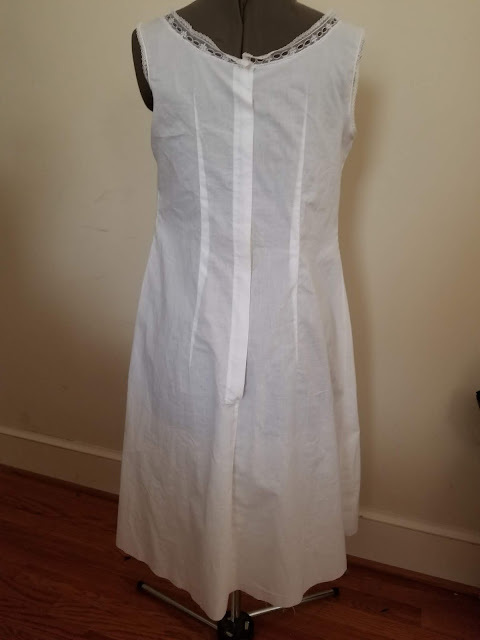 I put a hook and eye at the waist seam since I thought it would get more stress. 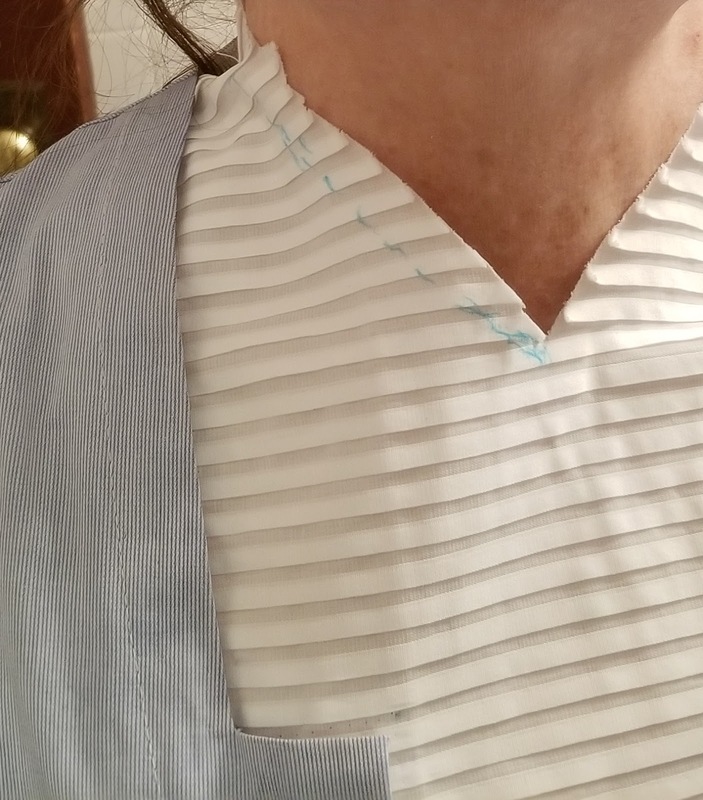 I tried the gown on again and decided that I needed to cut about 5/8 inch off of the neck. 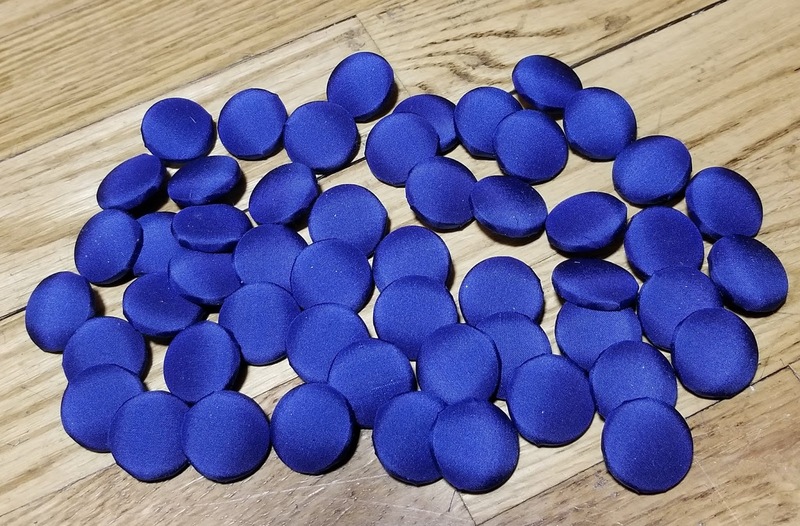 Next I got the rest of the buttons covered--48 in all. I needed a plain white fabric for the collar and I had several on hand. 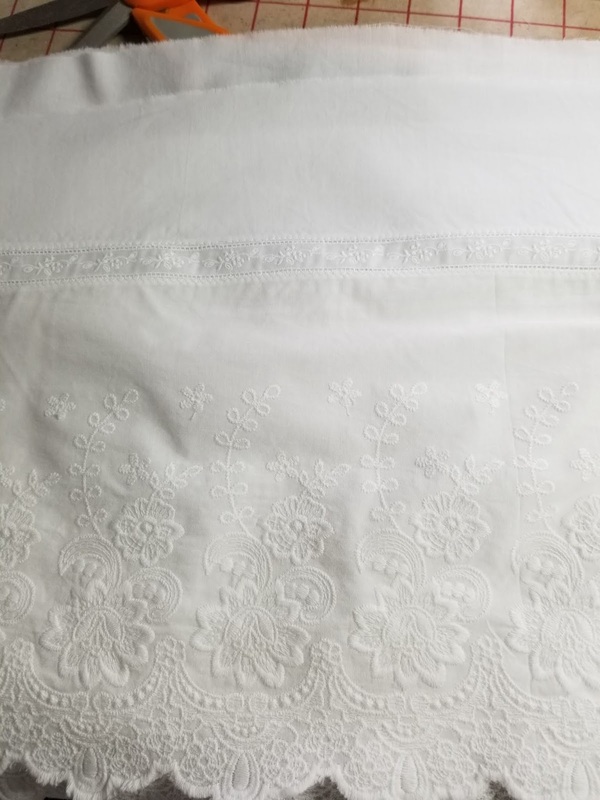 The pleated fabric is actually quite sheer and I found that the Swiss batiste I had was the best match. 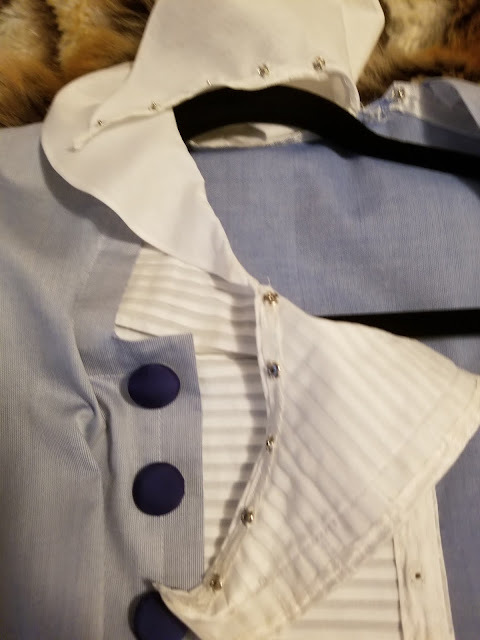 I measured the new neckline and altered the collar to fit. Because the batiste is sheer, I trimmed the seam allowance to less than 1/8 inch instead of snipping the curves as I knew it would show through. 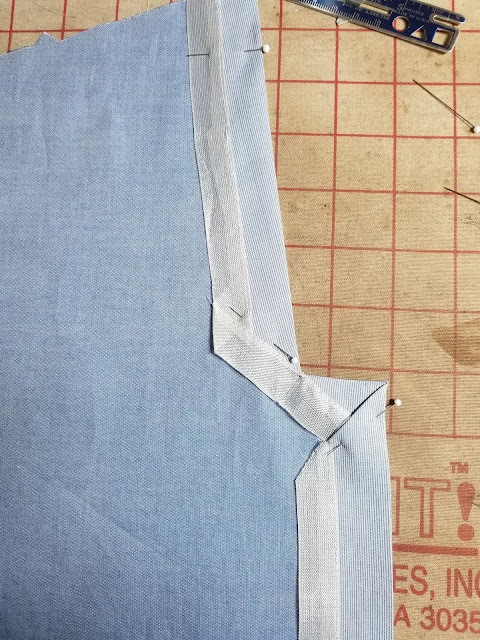 The tiny evenly cut seam allowance gave it a nice look on the outside. There are no neck facings in these garments. 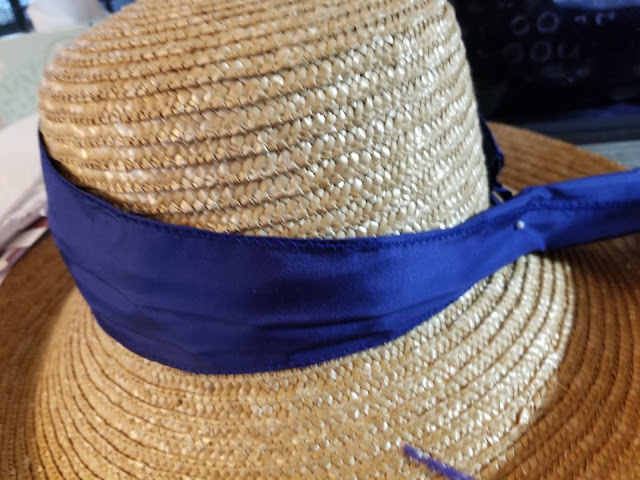 Typically the neck is finished with bias or some kind of binding. 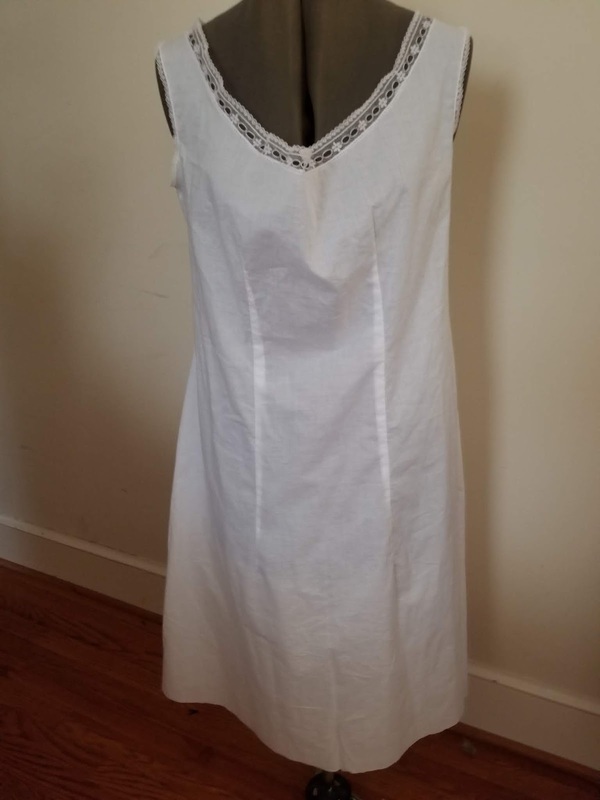 I stitched the collar to the closed side of the gown and around the back stopping at the shoulder on the right side. 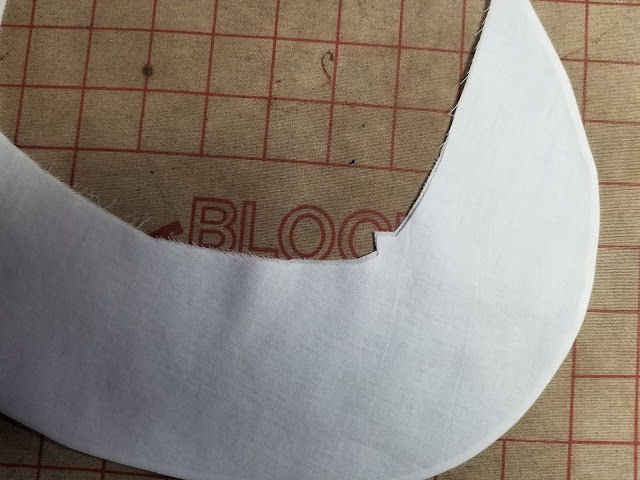 Then I bound the collar seam and the loose edge of the collar. I stitched small snaps on the collar seam allowance and inside the front neck edge. You can see the loose edges in the front, shoulder and neck. Last was the belt. 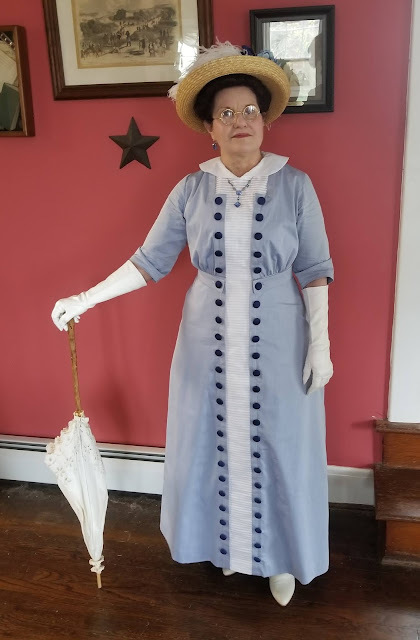 I measured around the high waist seam and cut the belt, made 2 buttonholes and buttoned the belt on the gown. Finished! 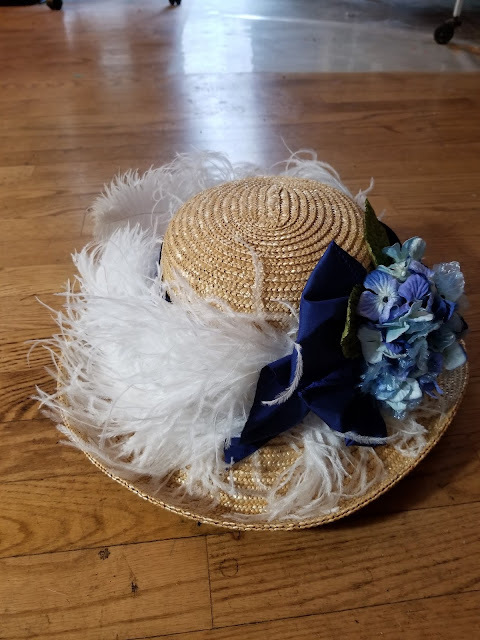 Next came the hat. 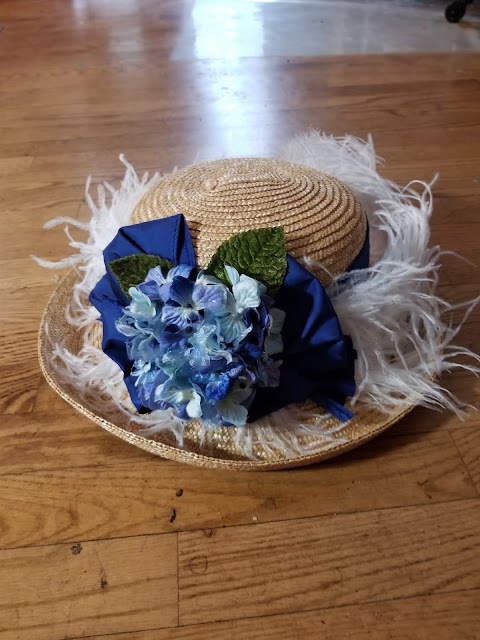 I love the big flowered garden hats of this era but this gown is fairly simple, having no lace and being cotton so I decided on a simpler style. I used the bottom right model as my inspiration. It has one flower cluster with plumes circling the crown. 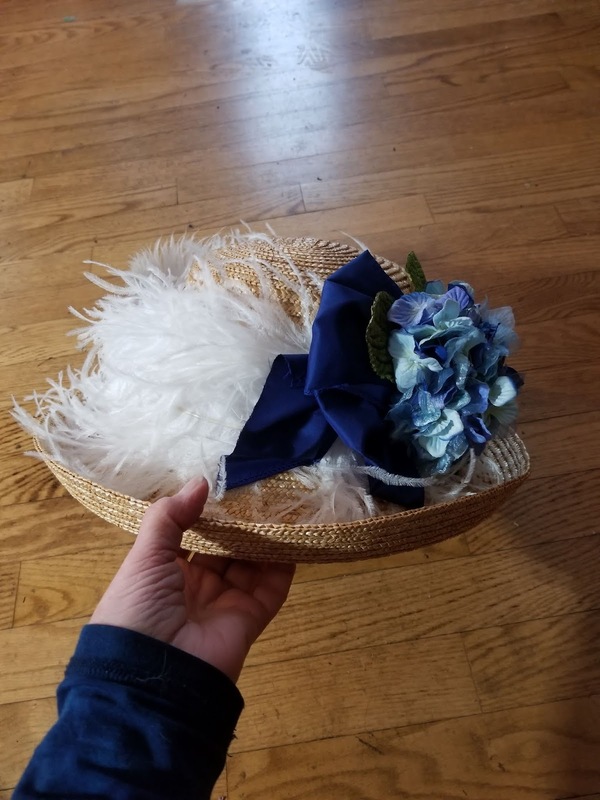 I found this one that I liked in my thrift store hat stash. I removed the ribbon. 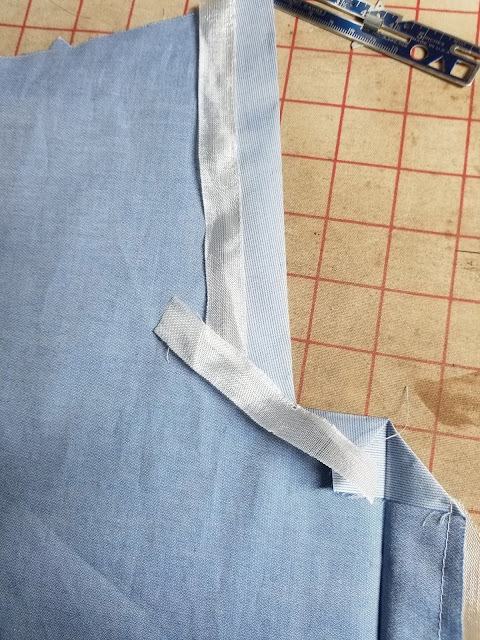 Then I cut 2 five inch wide crosswise strips of my silk and machine roll hemmed the edges. 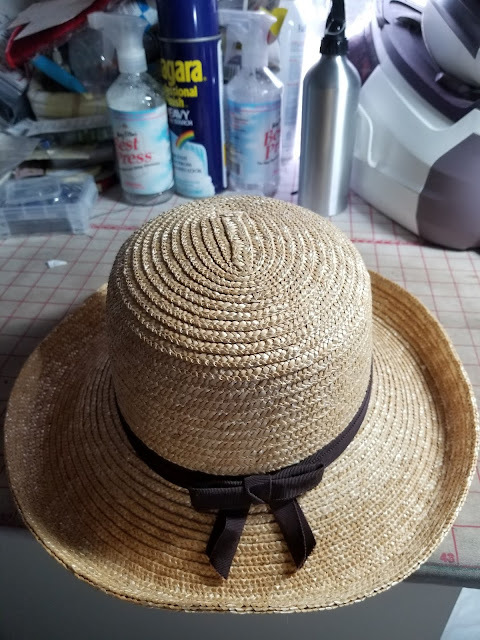 I pleated one onto the hat stitching the ends in place. 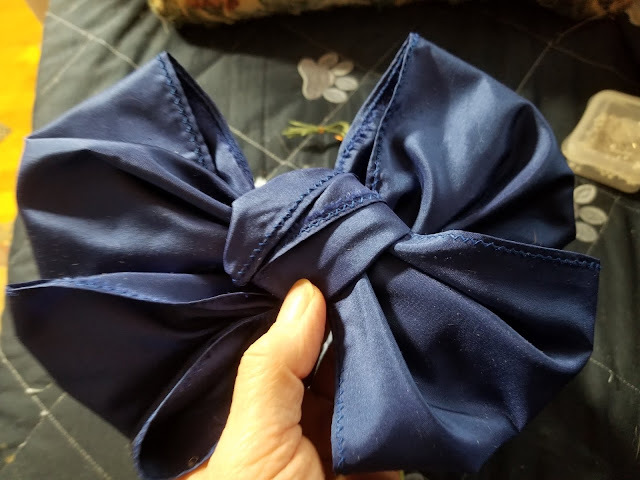 Then I used the other one to tie a 4 loop bow. I stitched the bow to the hat at the left front. I purchased some velvet hydrangeas and leaves so I bunched 2 of them together, added 2 leaves and stitched them over the center of the bow. Then I curled my plumes and stuck them behind the bow. 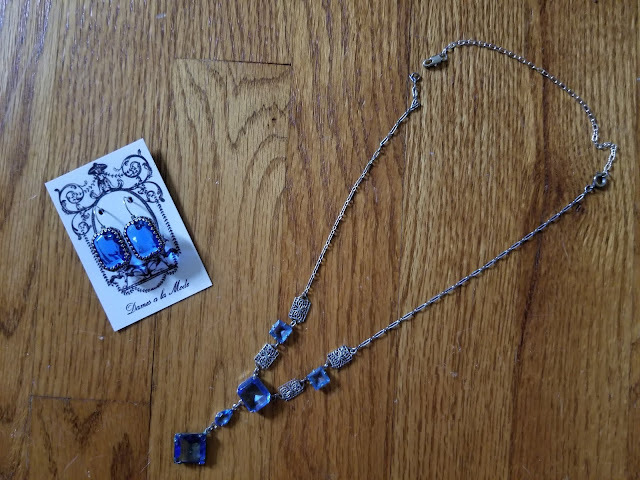 I bought this cheap Edwardian necklace at an auction. It seems to be made of some kind of pot metal with glass. I added an extender chain. Then I found some glass earrings from Dames a la Mode that were a good match. Jan, me and our new friend Iris, who sat with us at tea. We had a lovely day. 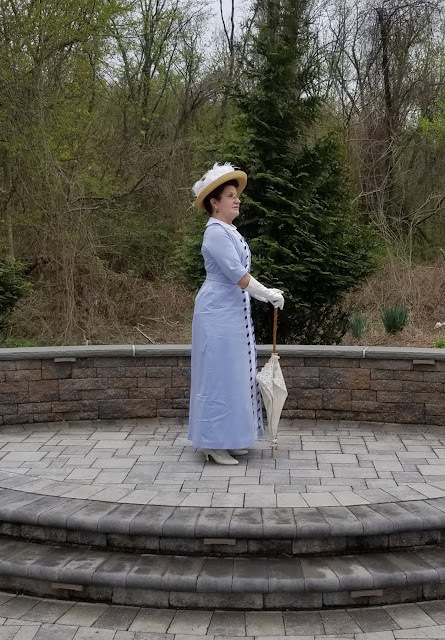 I was pleased with the outcome of this project. I learned a lot. I did end up getting another period sewing book, dated 1912. 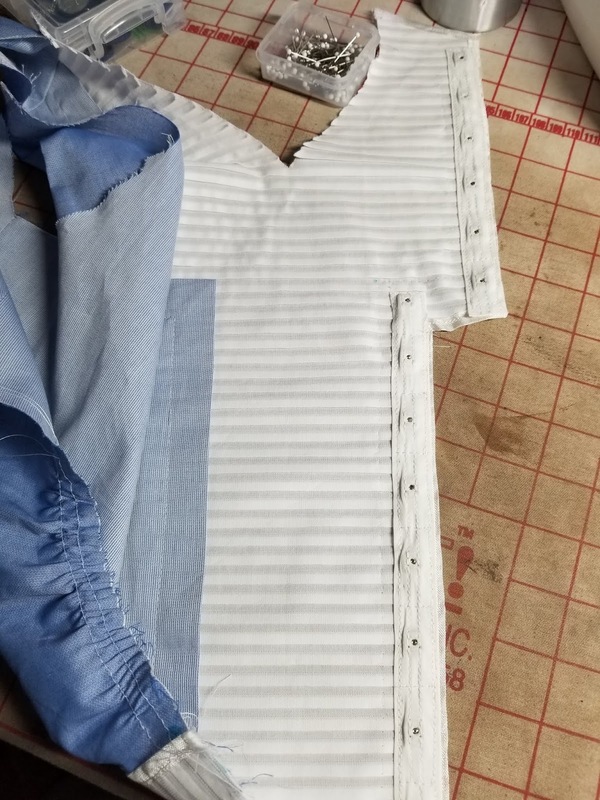 I'm fascinated with the way garment construction constantly changes and I like to learn the period techniques. 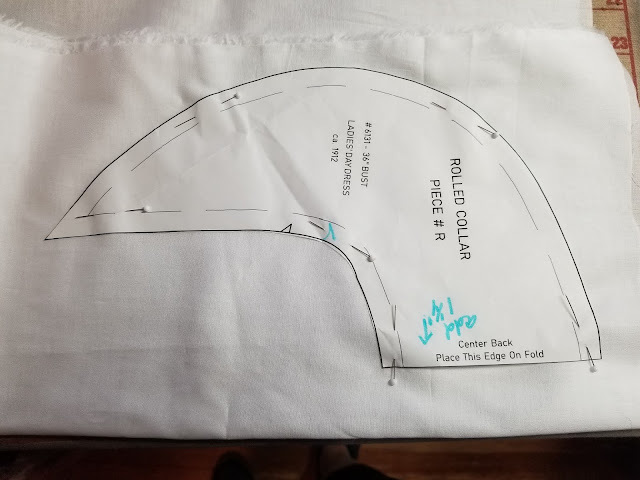 Using a period pattern forces one to learn as the instructions are vague and the pattern is clearly not made to use modern techniques. 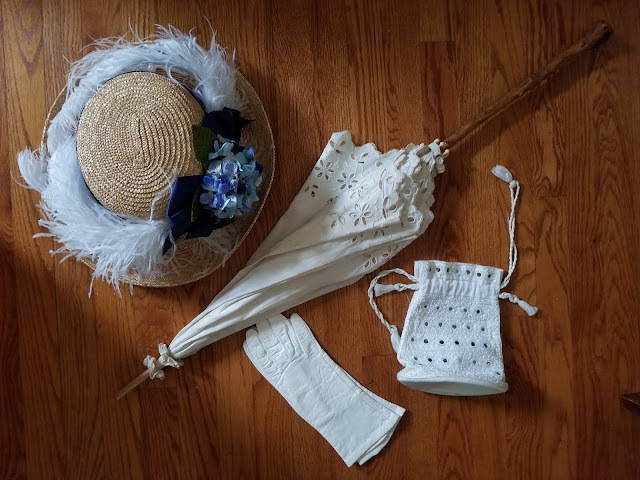 Time to add to my Edwardian underpinnings collection. I've been needing drawers so that was the next thing on my list. 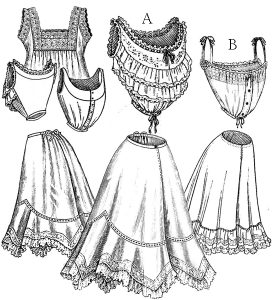 I decided on the Truly Victorian TV02 Edwardian Underwear pattern with the hope of making drawers and a corset cover. 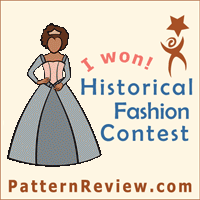 I like that this pattern has several designs of corset covers including the ruffled one for the pigeon breast look of the early 1900s. I opted for the plain ruffled drawers at the bottom right. 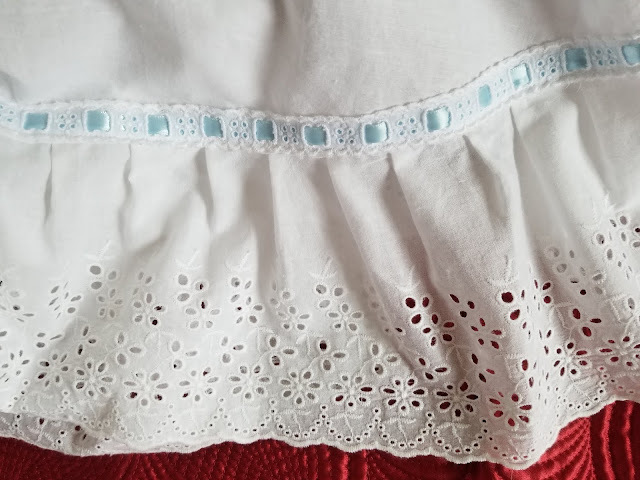 Instead of making a ruffle, I decided to purchase a swiss embroidery to use as the flounce. 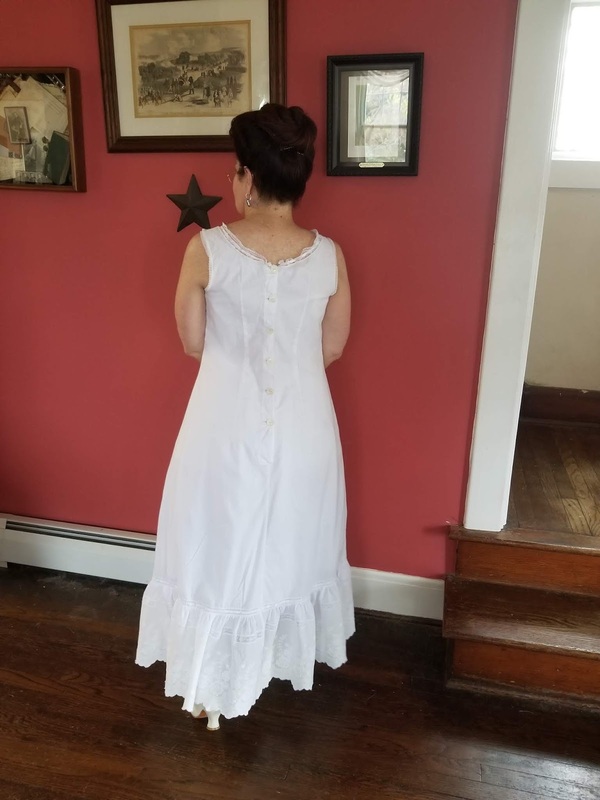 Instead of a corset cover, I decided to make a full length darted princess slip--this one by Past Patterns which is reprint of a vintage pattern. 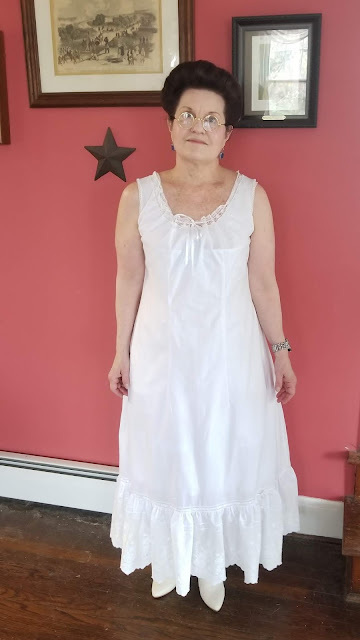 It came in a size 36 so it needed very little in the way of alterations other than adding a little to the hips--which is standard for me. You can see the crotch seam with the facing here. 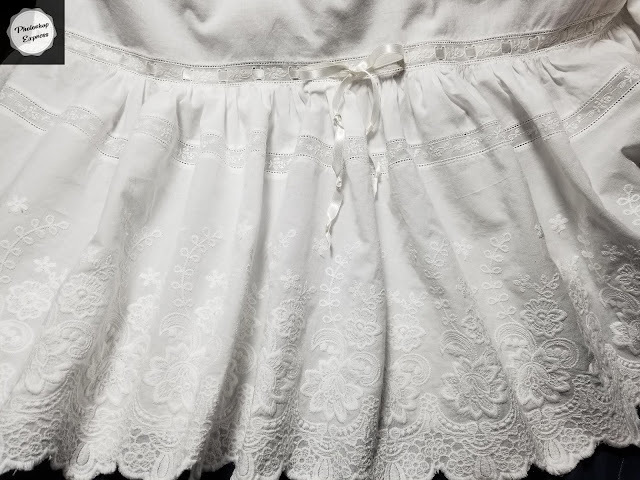 I covered the flounce seam with beading and ribbon. Next up is the petticoat or slip. 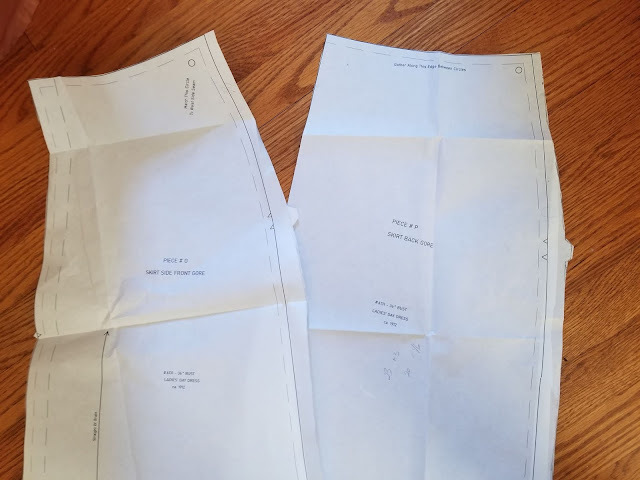 It was a vintage pattern with 3/8 inch seams--also quite straightforward. 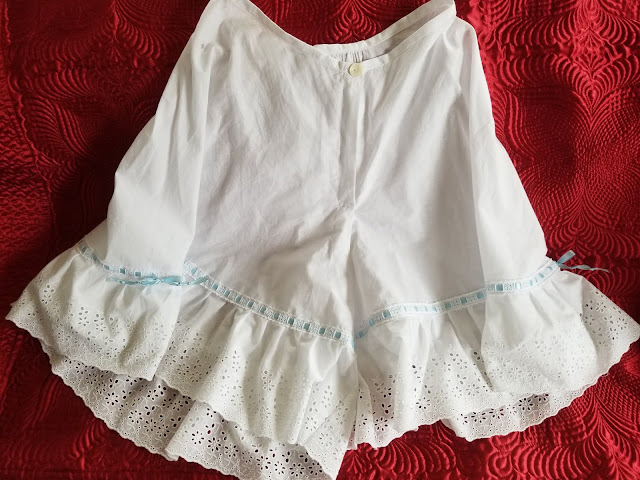 I did lengthen the shoulder straps a little and I added French beading and edging to the neck and edging only on the armhole. 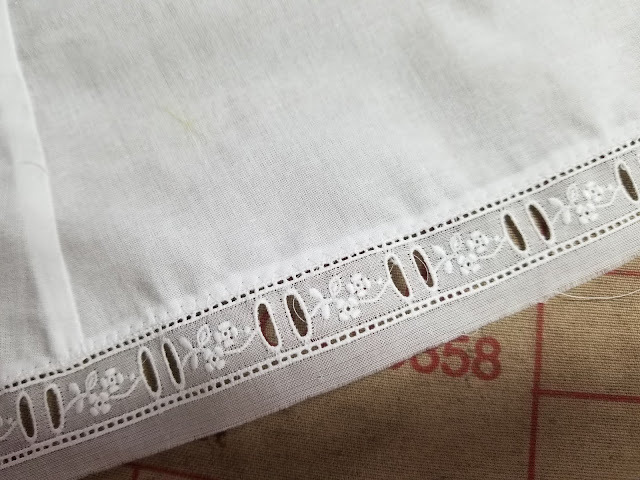 Had I known I would use Swiss embroidery on the flounce I would've used Swiss beading but this works well. I then constructed the flounce using the wide Swiss edging, a strip of insertion and a strip of fabric. 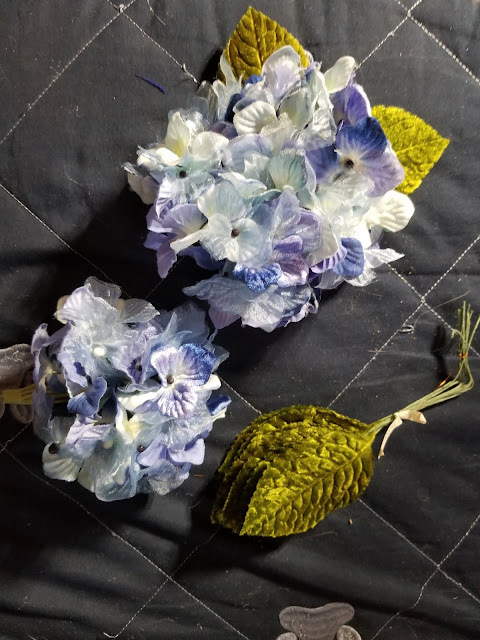 I gathered the flounce to the beading. Then I ran ribbon through the beading. I finished the slip with buttonholes and antique mother of pearl buttons in the back. So here's the underwear as worn: First chemise then corset. Then the drawers go on top. Then the slip goes on top. I was pleased with the way both of these pieces turned out. I think I'd actually like to make another princess slip in silk. Wearing a cotton slip under a cotton dress poses some challenges in that the dress didn't slide so easily. It was comfortable though given that it was a worm day. I recommend both patterns to anyone looking to make these garments. I also ordered some Swiss batiste to make a drawers/corset cover combination garment with a lot of inset lace. No rush on that one though! Musician, Artist, Teacher, Sewist, knitter, Historic Reenactor, cat rescuer. Click Here to see my Wish List!